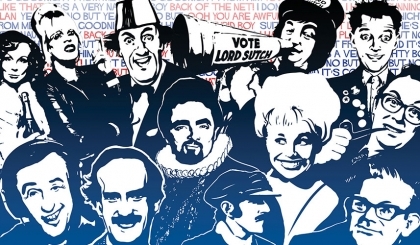 Monster Raving Loony is a fast-paced, hilarious theatrical feast for the heart and mind. 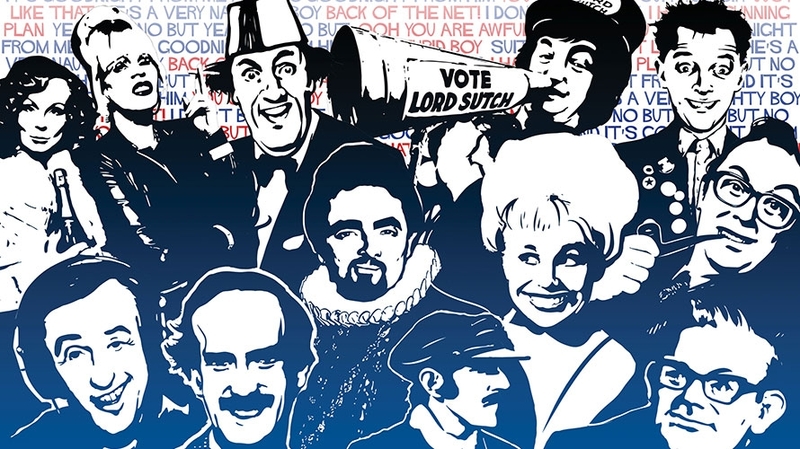 This moving journey through the life and political exploits of Screaming Lord Sutch features a full house of iconic cameos including Alan Partridge, Monty Python, Morecombe and Wise and Blackadder. Seen through the eyes of one extraordinary man, Monster Raving Loony asks if the British sense of humour can begin to uncover who we are, where we have been and where we are going next. A Theatre Royal Plymouth production written by James Graham. Running time: approximately 2 hours (no interval). With thanks for support from the John Ellerman Foundation and THE LECHE TRUST. Book your tickets by selecting the Date & Times tab above. A 70p per ticket booking fee is included on all bookings made online, by phone and in person, for any payment method, up to a maximum of nine tickets. An additional 80p postage fee applies for tickets that are mailed to customers. Corporate Member, Ambassador, Group and School tickets do not incur a booking fee. An action-packed, idea-crammed, bespangled show. An ingenious bit of writing. Graham’s play is pretty bonkers. Fair play to him. Graham has that rarest of gifts, pin-sharp comic timing. Joseph Alessi’s recent theatre credits include The One That Got Away (Bath Ustinov Studio), The Hook (Liverpool Everyman), Brief Encounter (Broadway/ US & Australian tour), Midsummer Night’s Dream (Royal & Derngate), The Wind in the Willows, Privates on Parade, Jerusalem (all West Yorkshire Playhouse), Wonderful Town (Royal Exchange Theatre/UK tour), Antony & Cleopatra, Julius Caesar, The Tempest (all RSC). His television credits include I Live with Models, Mummy’s Boys, Mr Selfridge, God on Trial, Revelations, In a Land of Plenty, Wing and Prayer, Kavanagh, Pie in the Sky, All in the Game, The Chief. His film credits include The Other Woman, Family Business, Bridget Jones’ Diary, London Kills me and Chaplin. Camilla Beeput’s recent theatre credits include In The Red and Brown Water (Young Vic), Bad Girls (Garrick Theatre), Daddy Cool (Shaftsbury Theatre), West Side Story (Leicester Haymarket) and Money To Burn (The Venue). Her television credits include Partners In Crime, New Tricks, Bull, Grantchester, Birds of a Feather, Legends, Scott and Bailey, Me and Mrs Jones, White Van Man, Peep Show, Death in Paradise and Top Boy. Her film credits include Writer’s Retreat, Mortdecai, Superbob and Harry Hill The Movie. Joanna was born in London and trained at Webber-Douglas. Recent theatre includes: The Rise and Fall of Little Voice (West Yorkshire Playhouse and Birmingham Rep) The Importance of Being Earnest (Nottingham Playhouse) The Physicists (Donmar Warehouse) The Rivals, Spring and Port Wine and The Admirable Crichton (The New Vic Stoke), The Daughter in Law (Watford Palace Theatre) The Biggleswades (Southwark Playhouse) The Waltz of The Toreadors (Chichester Festival Theatre) The Best 100 Plays of the Century (The Royal National Theatre). Television includes: Uncle, The Tunnel, Mr Selfridge, Law and Order UK, Boomers, Siblings, Doctors, Holby City, Taking The Flak, Phoneshop, Dancing on the Edge, Mrs Biggs, Bad Girls, Fifteen Storeys High, John Mortimer’s Titmuss Regained and Julian Mitchell’s Screen Two film Survival of The Fittest. Radio includes: Ed Reardon’s Week, The Exorcist, Votes For Women, The Archers, Mr Bridger’s Orphan, Up The Junction, Georgy Girl, The Author of Himself, Weekending, House of The Spirit Levels, Double Income No Kids Yet. Films include: In the Loop, The Infidel, Little Dorrit, Under Suspicion, Their Finest Hour and a Half, Pauline. Jack trained at the Royal Welsh College of Music & Drama. James’s theatre work includes The Vote (Donmar Warehouse, broadcast live on More4 on election night); The Angry Brigade (Plymouth Drum & Bush Theatre); the Broadway musical Finding Neverland, written with Gary Barlow and Eliot Kennedy; Privacy (Donmar Warehouse); This House (National theatre – nominated for the Olivier Best Play Award); The Man (Finborough Theate and on tour); The Whisky Taster (Bush Theatre) and Tory Boyz (Soho Theatre). As Writer in Residence at the Finborough Theatre his plays include Albert’s Boy, Eden’s Empire and Sons of York. His television writing includes last spring’s political drama Coalition (Channel 4), Prisoner’s Wives (BBC1) and Caught in a Trap (ITV1). His first feature film X+Y was released last year after being selected at the Toronto International Film Festival and London Film Festival, winner of the Writer’s Guild Award for Best Debut Screenplay. Simon Stokes is the Artistic Director at the Theatre Royal Plymouth. He was Artistic Director at the Bush Theatre through the 1970s and 1980s. Thereafter, alongside a freelance career, he was Associate Director and Director of Development for the Turnstyle Group in London’s West End. He trained at the Bristol Old Vic Theatre School and has directed abroad in Germany, Switzerland, Israel and the USA. His most high-profile work has included Emmanuel Darley’s Tuesdays at Tesco’s with Simon Callow (Assembly Productions); Kiss of the Spiderwoman with Callow and Mark Rylance (Bush); When I Was a Girl I Used to Scream and Shout by Sharman Macdonald, with Julie Walters, Geraldine James and Dawn French (Bush and West End); A Slip of the Tongue by Dusty Hughes, with John Malkovich and Ingeborga Dapkunaite (Steppenwolf Theatre Chicago and West End), and, in Plymouth, he directed Carl Grose’s Grand Guignol and Horse Piss for Blood, The Astronaut’s Chair by Rona Munro, Nostalgia by Lucinda Coxon, Moonshine by Snoo Wilson and both The Green Man and Presence by Doug Lucie. Cal McCrystal trained at the RSAMD and at École Philippe Gaulier. His career spans theatre, film, TV, Opera and Circus. Cal has been at the spearhead of British comedy over the last 15 years creating shows for companies such as Spymonkey, Peepolykus and The Mighty Boosh. His productions are regularly seen worldwide. He was Comedy Director for the RNTs West End and Broadway hit, One Man, Two Guvnors and he created clown routines for Cirque du Soleil’s Varekai and Zumanity. He has directed countless tours and productions for British repertory theatres and London’s South Bank and Barbican Centres. Since 2012 he is director for the acclaimed Giffords Circus. Cal is Comedy Director for Don Quixote at the RSC and Andrew Lloyd Webber’s School Of Rock on Broadway. Cal works as a comedy consultant on major movies including The Dictator, The World’s End, Man Up, The Amazing Spider-Man 2 and Paddington. For The Drum: Edward Gant’s Amazing Feats of Loneliness, Chekhov in Hell, The Astronaut’s Chair, Solid Air, The Empire (Royal Court Co-Production), Hijra (Bush Theatre Co-Production). Other designs include: Pumpgirl, The God Botherers, Bottle Universe, Stitching (Bush Theatre, London); The Lying Kind (Royal Court); The Way Home, Paradise Bound (Liverpool Everyman); Love Me Tonight (Hampstead Theatre); Translations, Moll Flanders (Bristol Old Vic); Never Forget (Savoy Theatre); Anita and Me (Birmingham Rep/Stratford East); La Cage Aux Folles (Denmark), The Woman in Black (Vienna); Cabaret, Hair, An Ideal Husband, An Inspector Calls, Breaking The Code, The Glass Menagerie (Frankfurt); Reigen (Munich); Angels in America (Sheffield Crucible); The Lieutenant of Inishmore, Anything Goes, The New Statesman (UK tours). Opera includes: Tosca (Netherlands); Macbeth, La Sonnambula, Fedora (Opera Holland Park); Don Giovanni (BYO); The Bartered Bride, La Vie Parisienne (Royal College of Music). Dance includes DV8’s The Happiest Day of My Life (European & UK tour); Horseplay, All Nighter (Royal Ballet). Theatre work includes Let The Right One In, Dunsinane, Caledonia, Realism, The Wonderful World of Dissocia (NTS), Bright Phoenix (Liverpool Everyman), Dancing at Lughnasa, Punk Rock (The Lyric, Belfast), Juvenalia, Tuesdays at Tescos (Assembly Rooms), Tartuffe, Khandan, Anita And Me (Birmingham Rep), Hope, The Pass, Narrative, Get Santa, Wig Out!, Relocated, (Royal Court), Hedda Gabler, King Lear, The House, Major Barbara (The Abbey, Dublin), A Soldier In Every Son, Measure for Measure, Marat/Sade, God in Ruins, Little Eagles (RSC), Farewell, Half a Glass of Water (Field Day, Derry), Uncle Vanya (Minerva, Chichester), The Lady From The Sea, The Comedy of Errors, Three Sisters (Royal Exchange, Manchester), The Vortex (The Gate, Dublin), Scorched (Old Vic Tunnels), Fuente Ovejuna, Punishment Without Revenge, Dr. Faustus (Madrid), Orphans, Dallas Sweetman, Long Time Dead (Paines Plough), Jane Eyre, Someone Who’ll Watch Over Me (Perth Theatre). Gregory received the New York Drama Desk Award for Outstanding Sound Design for Journey’s End (2007) and he won the Tony Award for his Sound Design in Equus (2009). He has been nominated for a New York Drama Desk Award for Outstanding Sound Design for his work on Misterman. Chloe is the Resident Assistant Director at Theatre Royal Plymouth. Assistant directing includes: The Whipping Man (dir. Tom Attenborough, Theatre Royal Plymouth); City Stories (dir. James Phillips, St James Theatre); Mucky Kid (dir. James Farrell, Theatre503); A Tale of Two Cities (dir. Adam Spreadbury-Maher, King’s Head Theatre); 59 Minutes to Save Christmas (dir. Alan Lane, Barbican); A Progress (dir. Carl Heap, The Yard); Much Ado About Nothing (dir. Carl Heap, Cambridge Arts Theatre). Directing includes: A Doll’s House (Space Arts Centre); Object Love (VAULT Festival); Spark (VAULT Festival); Swindlestock (Rose Buford College); Twelfth Night (Japanese tour). Chloe has regularly collaborated with Secret Cinema (including The Shawshank Redemption, Brazil, The Grand Budapest Hotel and Miller’s Crossing) and created interactive installations for bodies including ArtsAdmin and In The Woods Festival. She has also worked on the literary teams of the Finborough and Courtyard Theatres. Originally from the North West Laura went to Nottingham Trent University to study Theatre design before specialising in costume. After graduating she moved to London to pursue costume making, in particular men’s tailoring. Laura joined a pre apprenticeship programme with Savile Row tailors and Newham College to continue studying men’s bespoke tailoring. Laura began working for the English National Opera very soon after the course finished and now holds a full time position as an in-house Wardrobe Mistress as well as working freelance with various theatres such as the Royal Opera House, The Roundhouse, Stopera Theatre, Amsterdam and various tours throughout Europe. After working for Theatre Royal Plymouth Laura will go on to work on Akhenaten for the English National Opera. Duncan’s theatre work includes – Deathtrap (Salisbury Playhouse); Hangmen (Royal Court/Wyndham’s); City of Angels, Henry VI, Privacy (Donmar Warehouse); Dr Strangelove and Star Wars – The Empire Strikes Back (Secret Cinema); Impossible (Noel Coward); The Hairy Ape, A Flea in Her Ear, The Tempest, The Real Thing, The Norman Conquests and All About My Mother (Old Vic); Urinetown (Apollo); Ghost the Musical (Germany); Richard III (Trafalgar Studios); Shrek the Musical (Drury Lane/UK Tour); War Horse Prom (Royal Albert Hall); The Bodyguard (Adelphi Theatre/UK Tour/Worldwide); Derren Brown – Infamous (Palace Theatre/UK Tour); Macbeth and The Flying Dutchman (NI Opera); Inside Wagner’s Head (Royal Opera House); If Only (Chichester Festival Theatre); Let It Be (West End/UK Tour/Broadway/Worldwide); All New People (Duke of York’s and UK Tour); Kristina (Royal Albert Hall); Frost/Nixon (Gielgud) and Evita (New Zealand Tour). Television work includes – BBC News, London Olympics 2012, BT Sport, The One Show, Strictly Come Dancing and BBC documentary, Unknown Islands. Tom trained as an actor-musician at Rose Bruford College, and works as an Actor, Music Director, Composer and Educator. Theatre: A Christmas Carol for The Castle Theatre Wellingborough As You Like It for Creation Theatre in Oxford, Cole at Frinton Summer Theatre and The Yvonne Arnaud in Guildford, the German première of Ghost the Musical at the English Theatre Frankfurt, Kate Tempest’s Hopelessly Devoted for Paines Plough/Birmingham Rep and The Wind in the Willows at West Yorkshire Playhouse. Tom worked at the National Theatre for 5 years contributing to The History Boys (Lyttleton, UK Tour, West End, International Tour and Broadway) and The Habit of Art (Lyttleton and UK Tour). Drama school productions include Soho Cinders (Arts Ed), Lysistrata Jones, Hands On A Hardbody (GSA) and The Rink (Mountview). Radio: The History Boys. Soldiers in the Sun (BBC Radio 3). Film: The Invisible Woman (BBC Films, directed by Ralph Fiennes).